Good day, WordPress bloggers and authors! Today we welcome a very special guest to the blog—Sarina Chandler, from the upcoming Family Matters (In the Best Interest of the Child, Book 2). Sarina is the mother of Books 1 & 2 protagonist, Olivia Chandler. SC: Well… technically, I was in book 1, too. FD: Yes, ma’am you were. But only in a flashback or two, and you weren’t… um, yourself. I thought it best to not approach the subject. SC: Oh, please! Now you sound like my daughter, not approaching the subject! I was crazy as a loon, out of my mind, off my rocker! It’s not as if I planned it or wanted to be committed to an institution and leave my daughter. FD: Of course not, ma’am. I’m sorry. SC: Please call me Sarina… and I’m the one who should be apologizing. I shouldn’t have been short with you. It’s just… I’ve missed most of Olivia’s life and a big part of my own. It angers me, I just have no one to be angry with. FD: May I ask… when did your mind begin to clear? SC: It’s been… about a year. FD: What was the first thing you remembered, Sarina? SC: *Looks down, fidgets with hands* The accident. SC: No, it’s fine. I’m fine. I’ve been silent for a third of my life. I need to talk, but if you don’t mind, I’d like to share that story first with my daughter. I owe her that… she deserves that. FD: Not a problem, Sarina. Glad to hear Olivia is coming to see you. SC: I don’t know for a fact she is coming. SC: I talked with Willis a few weeks ago. Willis Benson, the administrator of my husband’s estate. He and Olivia are close. I asked him to see if my daughter would visit me. But… it’s… been a few weeks now, and nothing. SC: Ugh! Stop apologizing already! Olivia and I were separated twenty-eight-years ago! I can’t expect her to make a quick decision for something like this. FD: Why do you feel it’s such a difficult decision for her? SC: Felicia, you know the last time I saw my daughter she was a ten-year-old. We had no other family and when I voluntarily came here… Olivia spent time in foster care. I’m told she last visited me five years ago… and I didn’t know who she was. I’m sure she has some resentment issues with me… and I can’t blame her. FD: Is there a specific reason you want to see your daughter, Olivia, other than simply a mother missing her child? SC: *Sighs* I need to apologize to her… for leaving her. While it wasn’t intentional or could have been changed, I still left her. Even if she never forgives me or sees me as her mother, I have to say the words. FD: Why is that so important to you, Sarina? SC: I had… issues with my parents. Before Ben and I married, I hated them. Afterward, I reached out to them for a fresh start but was ignored. I gave up, but if my mom had softened just a little and acted like she cared about me, I would have been there for her. It never happened. I don’t want to hide behind the walls of this place and allow Olivia to believe I don’t love her. I must try. FD: I’m sure you will, Sarina. I’m sure you will. I hope Olivia decides to see you. SC: So do I, Felicia. FD: Thank you for visiting with us today, Sarina. I know it wasn’t easy. SC: It’s easier than accepting I’ll never see my child again. She just has to come. Child-advocate attorney Olivia Chandler has made major progress in overcoming her childhood trauma and issues with abandonment. However, her refusal to see her mother is having a negative impact on her new romance with Bruce Bellamy and everyone Olivia is close to. Olivia enters specialized counseling for adults who suffer from childhood trauma but hinders her own progress when a major loss sends her spiraling back into the emotional comfort of the shadows in her mind. With her sanity at risk, Olivia Chandler needs answers to break free from the traumatic stress which holds her captive, but the answers lie with the one person Olivia refuses to see. 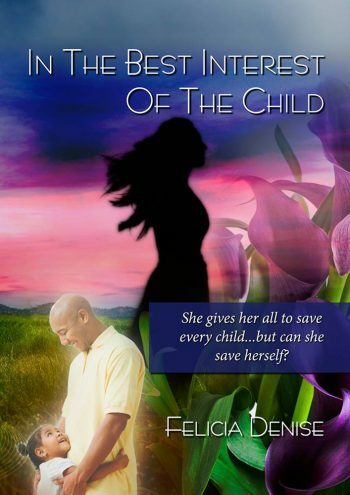 Olivia Chandler’s journey continues in Family Matters (In the Best Interest of the Child, Book 2), coming soon. Find out the back story. Guard her soul or open her heart? Olivia Chandler believed shunning personal relationships was her best defense to guarding her emotionally battered soul and never being hurt again. In honor of Throwback Thursday, we go back to In the Best Interest of the Child and the day Olivia Chandler and Bruce Bellamy meet. “Turn right in 1500 feet. Your destination will be on the left. 18569 Kilmer Lane.” Olivia was glad she had keyed the Bellamy’s address into her GPS system since fatigue from a rather busy and emotional morning had overtaken Rena right after Olivia entered the freeway. Several times during the forty-five-minute drive the sleeping child cried out. Olivia didn’t know if pain or fear were the cause, but it made her uneasy, regardless. Four months ago, Rena was living a normal life, no doubt trying to talk her parents into a cellphone and a Facebook account. Now her mother was gone, she had no idea how her father was, and she had pain every day to remind her of those things. Olivia wondered if she’d had any time to mourn. Did anyone hold her and let her cry? Was she allowed to at least express how much she missed her mom?. It wasn’t lost on Olivia that the two times Rena had mentioned her mom that morning, both were of her death. There were no memories of bedtime stories, birthday parties or preparing meals together. Her injuries kept her from attending Irene Averest’s funeral. Olivia doubted anyone even gave her an obituary from the service. Olivia made more mental notes of things to look into about Rena’s case when she saw 18569 up ahead. She slowed in front of the brick colonial home and put the car in park, not believing what she was seeing. And the hits just keep on coming. The home so resembled her own, she would bet the same firm designed them. She remembered all the trips to the architect’s office while their home was being built. In her mind, she saw Curious George books and a set of The Bible Story Books. A gumball machine? In the corner? She was sure there had been one. Olivia snapped out her memories when she saw movement at the side of the house. Making sure Rena was still sleeping, she exited her vehicle, following the sidewalk to the driveway where a flatbed tow truck came into view. A large, burly, dark-haired man was winching a late model Mercedes up onto the flatbed. Nearby, a far shorter man stood with his arms folded across his broad chest, obviously not happy. As she got closer, Olivia believed the shorter man to be near her age, even though a head full of curly black hair gave him a more youthful appearance. Olivia smiled as she passed the tow truck driver, noticing how his eyes lingered on her hips. The shorter man didn’t seem to notice her until she was right in front of him, and he started as though coming out of a trance. “Hello. Can I help you?” Olivia widened her smile. “Hello. I’m looking for the Bellamy residence.” He regarded her warily. “I’m Courtney Bellamy. What can I do for you?” She stuck out her right hand. “Mr. Bellamy, I’m Olivia Chandler, Rena’s court-appointed attorney. It’s nice to meet you.” Courtney Bellamy visibly relaxed. “Nice to meet you, Ms. Chandler. My wife, Marissa, mentioned you were meeting with Rena today. We can chat shortly, I just have to see when this guy will have my car up and running.” He spoke the last part of the sentence in a raised voice, making sure the tow truck driver heard him. The driver pulled a face in his direction. Olivia and Bruce both laughed out loud at Courtney’s snarky comment. “Let me get it back to the shop and find the problem. If it’s not a quick fix, I have a loaner vehicle you can use until yours is ready. Deal?” Courtney pumped his fist in the air. “This is why you’re my favorite mechanic! I love you, man!” Bruce guffawed. “Well, there’s that too,” Courtney quipped. Reaching for the side door entrance, Courtney Bellamy addressed Olivia. “Sounds good.” Olivia turned and started back down the driveway.” Courtney threw one last taunt at his cousin. “Stay away from my mother, and I’ll stay away from yours.” He caught Olivia’s eye as she passed and winked. She laughed at the easy banter of the cousins, and just for a second wondered what it was like to have someone in your life who had known you all of your life. Hearing her name being called just as she reached the sidewalk, Olivia turned to see Bruce jogging towards her. He stopped, only after he had more than invaded her personal space. He was taller than she first thought. Her three-inch heels put her at an even five foot, ten inches, and she still had to take a step back and raise her head to see his face. His light brown eyes had an amused glint to match the devilish smirk on his clean-shaven face. His collar-length dark brown hair was curly, though not as much as Courtney’s, and had the beginnings of grey at the temples much like her own. The man was shameless. Olivia couldn’t help but grin. His face turned on the most amazing shade of red. She laughed as she backed towards her car. He slid his hands into his back pockets and cocked his head to the side. She reached her car and noticed Rena was still sleeping. There was no sign of Courtney at the front door yet. She heard movement behind her and noticed Bruce had taken two steps in her direction. “Do you want to be?” Olivia tried without success not to laugh. “Nope. But I’m not this forward either.” Suddenly serious, he continued. “It’s just not every day I meet a woman I’m so drawn to… this is the first time it’s ever happened.” The sincerity in his voice caused her pulse to race. “I’m flattered, Bruce.” He started to say something else, but a sudden noise drew their attention to the front door as Courtney backed the wheelchair down the one step entrance, then turned and headed towards Olivia’s car. Taking a deep breath, she met his gaze. She smiled and gave him a single nod. His attention made her feel light-headed, but she knew she’d never call him. She couldn’t. He seemed like the type of man who wanted all or nothing… and nothing was all she had. Olivia moved to the car door as she unlocked it with the remote. She reached in to unfasten Rena’s seat-belt but caught the banter between the cousins. If Olivia didn’t know they were grown men, she would have sworn they were seventh graders. Rena stirred and looked around, confused. “Hey, angel. You’re home.” Still disoriented, Rena tried to sit upright. She cried out in obvious pain and gripped Olivia’s arm. “It’s okay, angel! It’s okay, I got you! Just breathe through it. C’mon, now. Breathe.” Olivia took her own advice and took two deep breaths to calm herself. She couldn’t comfort the child if she needed comfort herself. “Olivia?” She looked back at Courtney. “She’s as light as a feather, but that cast adds weight. Step back and I’ll transfer her to the chair.” Rena still held Olivia’s arm, but her grip was loosening. “You okay, angel? Mr. Bellamy wants to transfer you to the chair. You’ll feel better once you can stretch out in your bed, okay?” Rena nodded, and Olivia stepped back out of the way to give Courtney room to transfer her to the chair. She could feel Bruce’s eyes on her but refused to look at him. Her face grew hot, and she felt awkward and out of place. Her resolve was weakening, and she was about to look in his direction when a green minivan pulled up behind her car. Bruce clapped his hands together. Olivia could tell he was enjoying the moment and glanced back to the minivan not knowing what to expect. A plump woman exited the van and rushed towards them. She was short – maybe five-feet in height – and African-American with a mass of hair worn in a long, natural, wavy style. Though plump, her hourglass shape was more than obvious. She wore little makeup, and she didn’t need too. Her full lips and smooth brown skin were enhanced by large expressive eyes that right now were filled with worry. “What happened? Is everything all right?” Just as she reached Olivia’s car, Courtney raised Rena into his arms, pivoted, and placed her into the wheelchair. The woman glanced from face to face waiting for an answer. She threw a quick wave in Bruce’s direction, and he returned it. Olivia smiled at her while Courtney leaned over Rena’s chair and kissed the woman on the cheek. She took Olivia’s outstretched hand in both of hers and squeezed. “Oh yes. We spoke on the phone. So nice to meet you. And thank you for seeing her home.” She patted Rena’s shoulder and kissed the top of her head. “Hey Munchkin. Did you hit all your markers in therapy today?” Rena nodded. “All except the steps. I could only do two.” Marissa stepped behind her chair and started towards the front door. Bruce, Rena, and Olivia all snickered. “It’s the middle of the day, Courtney.” He started. “After I got Bri settled inside, I was going to return to the office, and my car wouldn’t start. I called Bruce to come over and diagnose the problem, but… she’s really sick. He has to take her in.” Courtney Bellamy looked as though tears might be a real possibility. Marissa turned her head and covered her mouth to hide the grin. She looked back and addressed Olivia. “Please excuse our family, Olivia. We’re not usually this scatterbrained and dysfunctional. And we usually care more about our sick children than our sick cars.” Before Olivia could tell her they were all just fine, Bruce chimed in. “Look up ‘dysfunctional’ in Webster’s and you’ll find our family portrait.” Marissa popped a clenched fist on one hip and shot back. Olivia heard someone join her in the laughter, but when she glanced at Courtney, his eyes were full of love and fixed on his wife. Olivia stepped around Marissa and looked down at Rena, who had dissolved into a fit of laughter. She clutched her bag of snacks with one hand and her stomach with the other. Olivia’s heart melted at the sight. She noticed Courtney step behind his wife, sliding his hand around her waist. Rena was still laughing when he said, “Once they get started, they won’t stop until Rena laughs.” He kissed his wife behind the ear while giving the thumbs up to his cousin. Olivia was taken aback. Most of what she’d just witnessed was a performance for Rena’s benefit. She was so glad she had not prejudged these people and admonished herself for any negative thoughts she may have had about them. These were good, loving people who were just living life. Parents and kids get sick and cars break down, but it didn’t distract them enough they didn’t have time for a little girl who was… at least for now… an orphan. Although Olivia was sure the Bellamys and Averests must have had a strong friendship for Courtney and Marissa to take Rena in, she knew this family would help any child in need. Olivia followed as Marissa pushed Rena into the house, but something made her stop and look over in Bruce’s direction. He was still standing there, hands in pockets, focused on her. Shaking her head, she smiled at him, which caused him to throw a big toothy grin back at her. Her face heated again, but she was rescued when she heard Marissa call out to her to follow her voice to get to Rena’s room. Check out the full story! Scene from the Upcoming Family Matters. Still struggling to overcome her issues of abandonment and salvage her personal life… and sanity, attorney Olivia Chandler attempts to visit the mother she hasn’t seen in five years and who’s been a resident at a private mental facility for almost thirty years. Visit with Sarina. She made it sound so cute and homey, Olivia thought. Olivia stared at the woman blankly, not knowing how to respond to the comment. Olivia frowned but didn’t ask the question on the tip of her tongue. The case manager’s long legs covered the distance across the sitting area in no time at all, with Olivia almost scurrying to keep up with her. Margot and Randie were always teasing Olivia about her brisk walking pace, but she had nothing on Sandra Riley! Olivia would guess Sandra to be at least six feet tall… and light on her feet. Reaching an unmarked door in the far corner, Sandra held it open for Olivia, who walked through and found herself standing in yet another sitting room, only this one resembled the average family room. Large, overstuffed chairs, throw rugs and even a flat screen television graced the area. Sandra pointed to a bulletin board on the wall near the door they’d just come through. Olivia tried to digest the information. Her mother was healthy? Required little or no supervision? Trying to reconcile this new Sarina with the bedridden, incoherent woman she last saw five years ago was difficult for Olivia. Sandra pursed her lips, thinking. Then she nodded. “I’m pretty sure Sarina was here for the group’s Valentine’s Day dinner dance, so that makes it eight months.” Sandra tried not to laugh at the horrified expression on Olivia’s face. Shaking her head, Olivia was incredulous. The case manager guided Olivia past the sitting area while answering. “River Ridge Meadows is a private care, private pay, voluntary commitment facility. We’re fully licensed by the state and the federal government. Insurance isn’t accepted here, and no resident is here against their will. We currently have one hundred and sixty-one residents ranging in age from seven to eighty-six. Most are from throughout the state, but there are a few from other parts of the country, and even four from Europe. River Ridge has two permanent, board certified psychiatrists, two permanent, board certified medical doctors, six psychologists, and a nursing staff of 40 that includes licensed physical therapists. Olivia pressed her hand against her stomach, the tiny nervous tremors threatening to morph into a full-fledged earthquake. Heat enveloped her body as the familiar tang of bile crept up the back of her throat. Closing her eyes, the nervous woman tried to will the anxiety away. You’ve come this far, Chandler, don’t you dare freak out now! Olivia Chandler’s latest client is eleven-year-old Rena Averest. Rena and her parents were involved in a weather-related, multi-car accident. Her mother was killed and her father was severely injured and comatose for several weeks and remains hospitalized indefinitely. Rena suffered extensive injuries and was also hospitalized for several weeks. When she was well enough to be discharged, the hospital ran into major obstacles. Her mother’s only living relative was an older brother who lived two thousand miles away. Suffering from chronic cystic fibrosis, he was unable to care for Rena and had in fact, even missed his sister’s funeral. Rena has grandparents, and two aunts on her father’s side of the family…and they want absolutely nothing to do with her. A benevolent judge, taking into account all that Rena is currently dealing with, allows her to be placed temporarily with Courtney and Marissa Bellamy, friends of her parents since college, and Rena’s godparents. Not knowing how her father’s medical situation will resolve itself, the judge feels Rena needs the stability and familiarity of the Bellamy home. The Department of Children’s Services disagrees and take legal action to remove Rena from the Bellamy home and place her in foster care. The presiding judge spurred on by the irony of DCS wanting to remove Rena Averest from a non-relative home only to place her in a non-relative home, stays the case and appoints a child advocate attorney to research the case and protect Rena’s interest. And that’s exactly what Olivia intends to do. Dynamic and vivacious Margot Schultz never met an obstacle she couldn’t overcome… or knock down. Executive assistant/office manager to Olivia Chandler, Margot always seems to know the right amount of charm, wit, and panache to use when dealing with anyone from grumpy judges to cagey Department of Children’s Service employees to Olivia’s peers – some of whom are less-than-ethical. The two women have worked side by side for ten years. Olivia admired Margot’s work ethic. She encouraged Margot to continue her education when time allowed, and even paid for it, calling it a ‘sound investment.’ Margot would eventually advance from executive legal secretary to executive assistant and office manager.